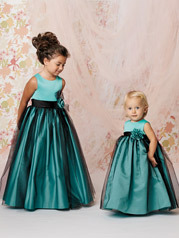 Shown in Black/Pool�Satin bodice with contrasting waistband and matching full tulle skirt. Horsehair braid bow and satin flower at waist. Available in ankle and floor lengths. Available in any Tulle color in combination with any Crystal Satin color with a Black or White horsehair bow. Not available in solid Light Ivory. Toddler verion available as style K278.